A brief flourish of spring had us casting off scarves, gloves, and even tights for a couple of days. Things dried on the line in no time, the sun being helped by a good stiff wind. One person in the house breakfasted outside and even the cat untucked her head from under her paws and ventured out for more than five minutes at a time. Camellias have been at their best, with no brown stains as – until today – there has been little rain. Fruit trees are budding. New young fruit trees espaliered on slender iron supports curve generously round the back wall of Julian Dunkerton’s (co-founder of Superdry) latest hotel on the Promenade and add interest to our regular walks into town as we try to work out what the fruit will be. 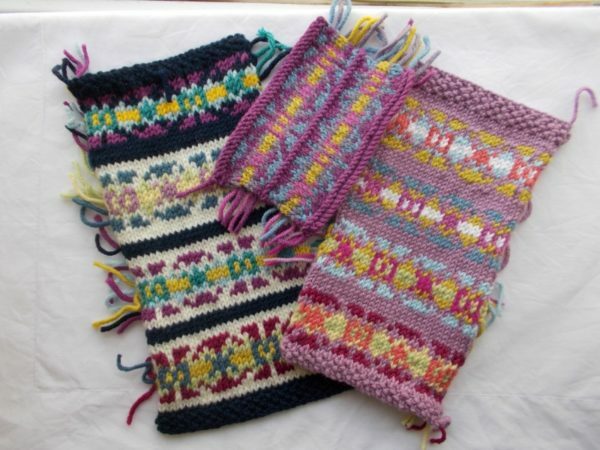 … in order to get some knitting to the point at which I have a good run of stocking stitch for the evenings. 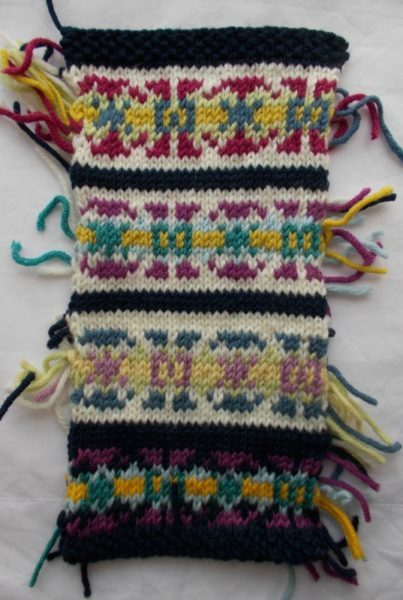 This means settling on a nice band of Fair Isle worked out as to colour and design and here I’ve hit another wall, for the pattern I keep going back to in Mary Jan Mucklestone’s book I just can’t get to satisfy me as to colours. I’ve now tried the design on four backgrounds and none of them quite work for me. So, I’ve abandoned this design and chosen something else. 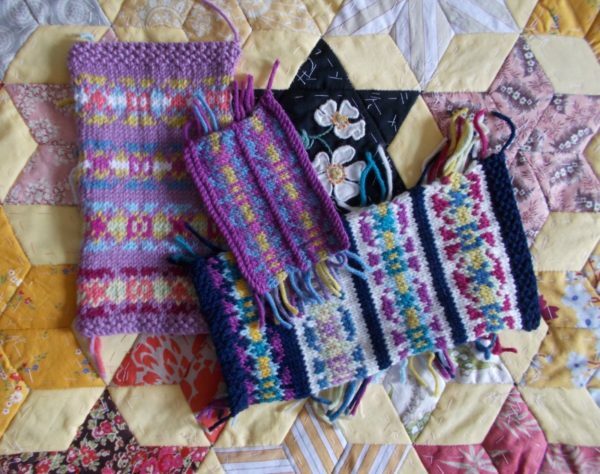 Probably I’ll get taken with one of the samples later and find just the right used for it – that’s the joy of spending a bit of time on trial samples – you always have them to refer back to. You must have a wonderful collection of trial samples by now! I love the picture of the cat you conjured up. I’m with her! Yes, she has been very tucked up all winter – I think her only exercise has been a daily rush around under the bed trying to catch my legs with a paw (claws out) as I make the bed! Looking forward to her getting out more. That sounds like perfect weather. The samples are beautiful, but I am excited to see what happens when you find the color combination you DO like. I’m a neutrals girl with most of my clothing, but when knitting for littles that doesn’t make as much sense I’m sure. I hope you find some combination you love. So sorry about the extra work at the end of the altar frontal. How frustrating!! I too am looking forward to finding the colour combination I feel happy with! I love working with colour and love living with it too – yellow is a particular favourite. However, when I think about it I tend to wear mostly navy, so you enjoy your neutrals if that’s what makes you happy.